IO Interactive's episodic stealth series returns with another fantastic dose of content. It may take you a whole six or seven hours to work your way through an episode of Hitman, but its most memorable moments typically come packed within a single minute of high-stakes tension. Hitman Episode 3 perfectly delivered one of these moments for me when it came time to disguise Agent 47 as a personal masseuse in order to access his target in an extremely vulnerable state. All told, this act took 60 seconds from beginning to end, but that was my final attempt—getting to that point took plenty of trial, error, and reloading saves. First, I had to figure out a way to get him off of his cell phone and to a location where I could easily knock him out. Then, I had to plan out the most inconspicuous way to do the deed. Finally, I needed to nail down the timing of my strategy perfectly so I could steal his clothes and dump his body without the flow of passersby noticing anything suspicious. And this is just one of a dozen possible ways to get closer to one of Episode 3's two targets. 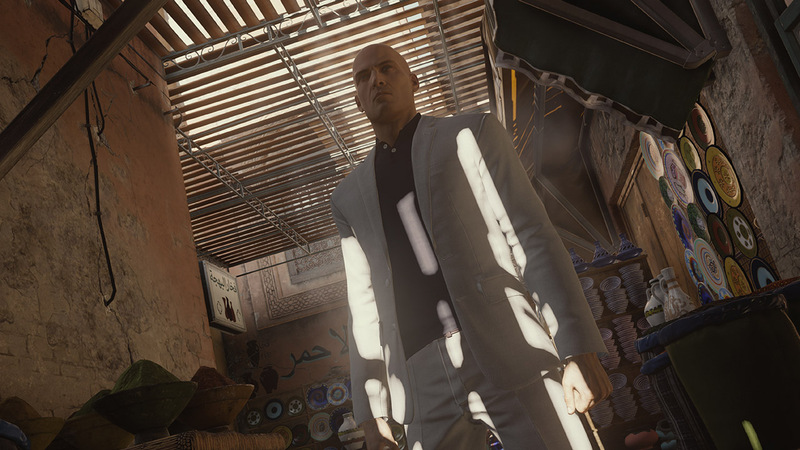 Episode 3 continues Hitman's ongoing excellence by crafting a unique scenario that tasks Agent 47 with approaching his objectives in a different way than his last missions. While Episode 1 took place at a bustling public event and Episode 2 dropped 47 into a very domestic setting, 3 uses political strife as its backdrop. With the help of a corrupt banker, an army general has developed the perfect situation for a military coup, and the only solution to this problem involves eliminating both men. 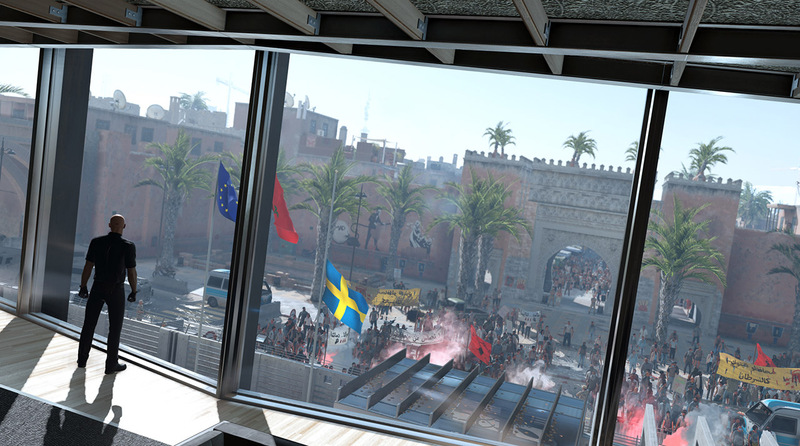 Taking out these two sends Agent 47 into the heart of two very different locations: The clean, elegant interiors of a Swedish consulate, and a dilapidated schoolhouse currently occupied by the military. In Episode 3, you'll be going through a lot of the same motions of Episodes 1 and 2—scouting for opportunities, testing the limits of different disguises, searching for helpful items—but this latest chapter definitely ramps up the difficulty a bit. While many events are helpfully contrived to take place just as Agent 47 reaches them, they aren't quite as out in the open this time. You'll have to put yourself in more danger simply for the chance to uncover opportunities, and this time around, especially important NPCs with especially important disguises aren't so easy to lure away into seclusion. Episode 3 has a real penchant for putting suspicious characters near those you need to subdue, leading to some situations where you'll have to act even faster and more efficient than before—and make even more creative use of your items and environment. This newest episode of Hitman may ramp up the difficulty, but it's generally frustration-free—outside of those 20-30 seconds you'll wait while loading a saved game. Even if things don't come so easy for Agent 47 this time around, the shortage of simpler options definitely encourages you to make more use of your tools, which I barely touched in my first times through Episodes 1 and 2. Tossing coins and using emetic rat poison to lure away NPCs were once viable options; now, they're absolutely necessary. Even if Hitman's episodic nature still seems completely artificial, it's still refreshing to see each new episode successfully build on what came before. But as I've said in reviews of previous Hitman episodes, splitting up the content like this actually incentivises players to get the most out of these huge levels before the next one comes along. I doubt I'd be willing to return to them and would most likely blaze through the whole game if Square-Enix dropped the complete package in my lap. If Hitman's episodic nature has kept you away, definitely consider giving it a try—it's shaping up to be one of the best games of the year no one's really talking about. IO Interactive continues Hitman's reboot with another sprawling level that doesn't disappoint. Even if its episodic nature doesn't feel completely necessary, each dose of content will keep you plenty busy until the next one arrives. Tagged with Hitman,	Hitman Episode 3,	IO Interactive,	PlayStation 4,	Reviews,	Square Enix,	Xbox One.